Introducing Our First Crop Ever of Grafted Tomatoes! Grafted vegetables are created when the top part of one plant (the scion) is attached to the root system of a separate plant (the rootstock). The rootstock contributes vigor and disease resistance while the scion is chosen for fruit flavor or quality. Produce growers have found that this traditional technique can dramatically improve plant health and increase harvests naturally and economically. Now, Log House Plants is making these amazing plants available for the first time to home gardeners in the U.S., at select nurseries throughout the Northwest. For centuries, grafting has been used in agriculture to enhance the health, yield, and fruit quality of woody species like fruit trees and grape vines. Large scale production of grafted vegetables emerged in Asia, where land has been intensively cultivated for many years. In the 1920s, growers there found that grafting watermelon plants onto squash or gourd rootstock significantly reduced the incidence of fusarium wilt. Today, 81% of Korean vegetables and 54% of all Japanese vegetables (95% of Japan’s watermelons, oriental melons, greenhouse cucumbers, tomatoes and eggplants) are produced on grafted plants. Vegetable grafting is also popular throughout Europe, especially in Greece, Spain, France, Italy, and Morocco. In the U.S., the technique’s potential for improving plant health and fruit yield without harmful pesticides, chemical fertilizers, or soil fumigation/steam sterilization is catching the attention of greenhouse produce growers and organic farmers, especially on the East Coast with its short growing season. Advantages of grafted vegetables include enhanced plant vigor, stronger disease resistance, tolerance of environmental stresses, and heavier crops that are produced over an extended harvest period. Disease resistance – This is probably the most important reason commercial growers initially turned to grafted vegetables. After Asian growers’ success with grafted melons in the 1920s, tomato grafting emerged in the 1960s as a strategy to avoid soil-borne diseases like bacterial wilt, which can be hard to eradicate in a tomato crop because of its wide range of hosts and ability to persist for years in the soil. When a grower raises tomatoes and other solanums (potatoes, eggplant, peppers) in the same fields or in the ground in greenhouses year after year, a range of fungal, bacterial, viral, and nematode diseases can become established in the soil, leading to a poorer yield with each subsequent harvest. Grafting has been found effective against verticillium wilt (Verticillium albo-atrum, V. dahliae), fusarium wilt (Fusarium oxysporum), corky root rot (Pyrenochaeta lycosersici), root-knot nematodes (Meloidogyne), bacterial wilt (Ralstonia solanacearum), Tomato mosaic virus, and Tomato spotted wilt virus. Tolerance to environmental stresses – Grafted plants are also more tolerant of environmental stresses like salinity or temperature extremes. 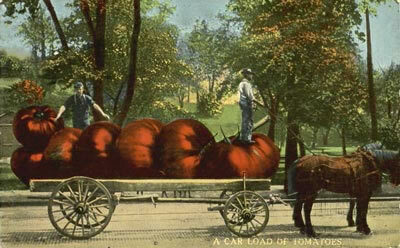 And with the ability to withstand hotter and cooler temperatures comes an added bonus – an extended growing season. Increased vigor and yield – Even for those growers and gardeners fortunate enough to have fresh soil and ideal growing conditions, grafting has its advantages. The vigorous rootstock increases the uptake of water and nutrients, for healthier plants and more abundant harvests without using chemical pesticides or fertilizers. Overall, grafted vegetables lead to bigger harvests of better quality fruits over a longer period with fewer harmful inputs. All tomatoes can benefit from grafting, but heirlooms, which are generally less disease resistant, can increase yields dramatically when grafted on special rootstock. Organic farmers find that they can achieve better resistance to pests and disease without soil fumigation or chemical pesticides, as well as higher yields without chemical fertilizers. Greenhouse produce growers are turning to grafted vegetables because the plants thrive and produce even when crops can’t be rotated frequently to fresh soil. 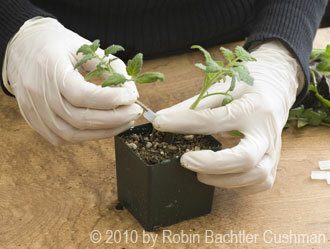 Tomatoes may be grafted using several methods, including side grafting or top grafting. In side-grafting, a notch is cut in the scion and in the rootstock, then the plants are clipped together at their notches and allowed to heal for several days before severing the scion’s roots and the rootstock’s shoot. After experimenting with several methods, we decided to use the Japanese top-grafting (or tube-grafting) method, a new technique that is fairly simple yet must be performed in carefully controlled conditions to avoid stressing the vulnerable, freshly grafted plant. When both rootstock and scion have developed 2-4 true leaves, we sever each seedling just below its cotyledon at a 45 degree angle, then use a special clip to attach the upper stem and leaves of the scion to the lower stem and roots of the rootstock. 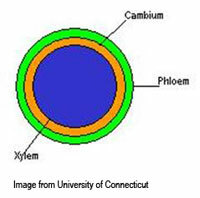 The stems must be the same diameter so their vascular tissue can align, allowing water and nutrients to flow up the stem. Once the scion and rootstock have been clipped together, we place them in a healing chamber which regulates temperature (70-80 degrees F), humidity (80-95%), and light to create the best conditions for the vascular tissue to grow together and the scar heal over. For the first 2-4 days the seedlings are kept in complete darkness. Over the next week or so, we slowly reintroduce the seedlings to light and reduce the humidity to accustom them to natural conditions. After another week or two in the greenhouse, they are ready to be transplanted into the garden. Throughout the process, the plants must be handled carefully to avoid disturbing the graft union. Preventing water stress is also crucial. Both scion and rootstock seedlings should be well-watered the day before grafting, which is best performed in a shady, protected area in the early morning or just after dark, when water transpirations are lowest. 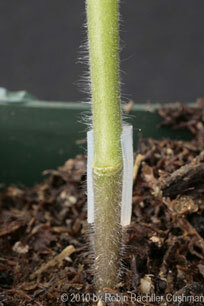 Handle carefully when transplanting to avoid bending or putting pressure on the graft. Plant at the same level the tomato is growing in the pot to keep the graft well above soil level so any adventitious roots that may form on the scion don’t come into contact with the soil. These vigorous plants will require stakes or cages, as well as careful pruning to ensure that the plant’s energy goes to fruit production and not excessive foliage. Remove any suckers that form below the graft or any roots that emerge above the graft. Look for them around the Northwest! This month Log House Plants is sending out our first crop of grafted tomatoes to select independent retailers around the Northwest. Look for favorite varieties like ‘Brandywine’ and ‘Black Krim,’ grown on the rootstock ‘Maxifort,’ an extremely vigorous tomato which would churn out hard, awful-tasting little fruits if allowed to grow on its own, but leads to generous and early yields of delicious tomatoes when grafted to a tastier variety. We chose ‘Maxifort’ for its high resistance to tomato mosaic virus, corky root rot, fusarium wilt race 2, verticillium race 1, and nematodes, as well as its moderate resistance to fusarium wilt race 1. In addition to single-grafted tomatoes, we’re experimenting with other vegetables (like peppers and eggplant) and double-grafted plants. Double-grafting involves attaching two scion plants to the same rootstock, so that you can grow two different cultivars on one plant. You may have seen apple trees that produce two or three different kinds of apple – how about a tomato plant that produces both ‘Red Brandywine’ and ‘Yellow Brandywine’? 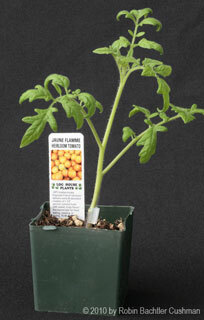 Or ‘Black Cherry’ and ‘Snow White Cherry’ tomatoes? Or ‘Hansel’ and ‘Gretel’ eggplants? We’re growing them right now, and hope to introduce them to you soon!